By Nicolas Stecher for WIRED. THE WORD "MASSAGE" glowing in a dark alley. That buzzing "Pabst" sign hanging in your favorite dive bar. For decades, neon signs have lit up every corner of urban life. And although commercial uses have dwindled (blame LEDs), the craft of making these signs is still alive. 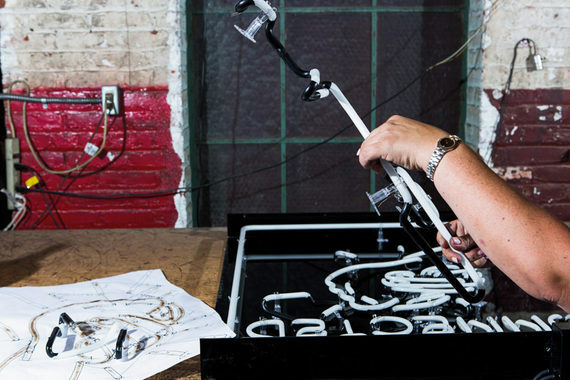 Neon makers, known as benders, are now just as likely to be designing signs for art galleries as they are for businesses. 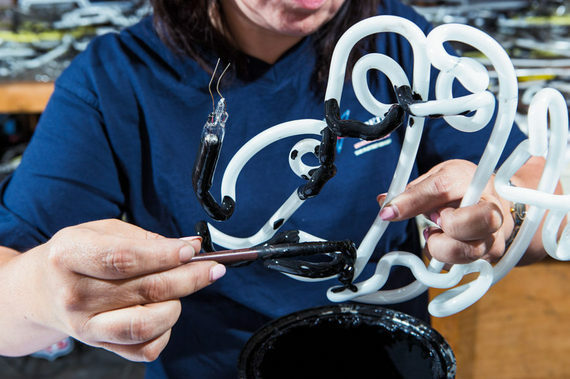 "It's a new contemporary sculpture," LA artist Patrick Martinez says. "I love the pulsing, hypnotizing saturated colors neon has to offer." We asked him to illuminate the process. After sketching a basic concept, Martinez refines the design in Photoshop. 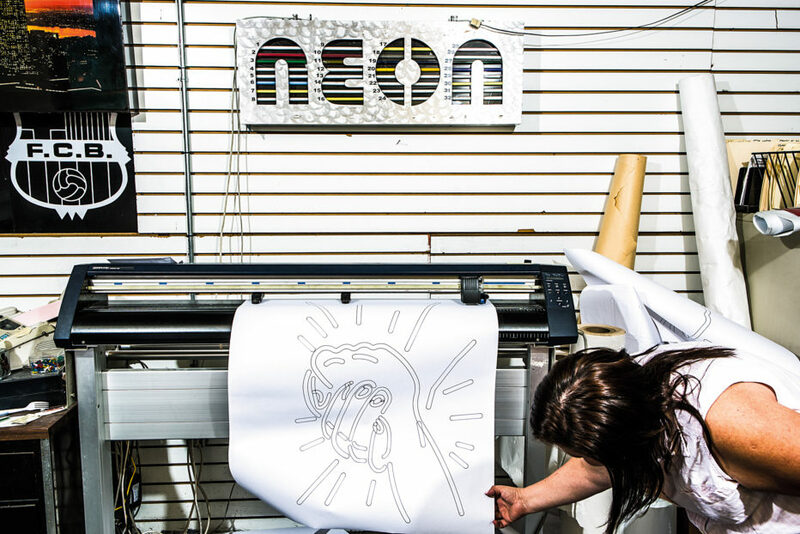 When it's ready, his pattern maker, Sylvia Duarte, prints out a full-scale version on a sheet of white paper. Duarte fills the tubes with gas (through a glass straw, shown), then seals off the ends with electrodes-- they'll charge the particles inside. The color of the sign depends on the tint of the tubing and the type of gas. 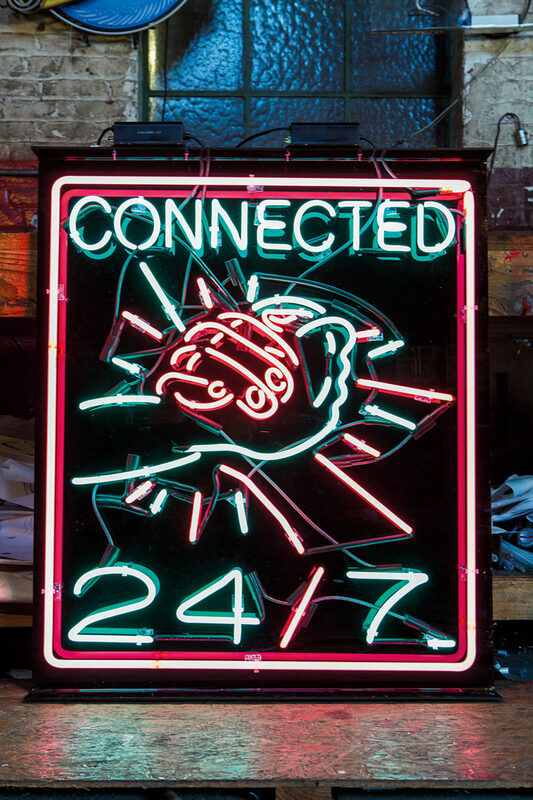 Neon imparts warmer hues, like the pink in this sign. The turquoise segments contain argon. 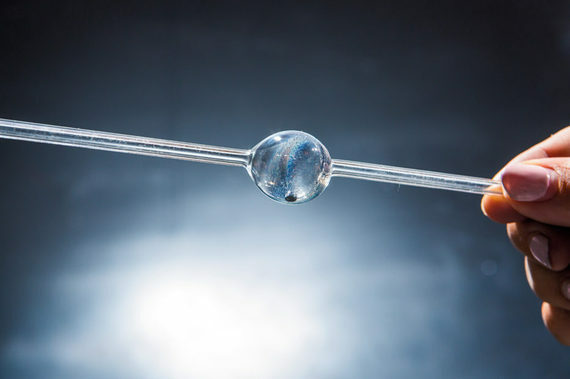 Since benders form words from a continuous stick of glass, there's extra tubing between the letters that makes it look like one long string of spaghetti. To ensure that the individual characters are legible, Duarte blacks out these superfluous bits with a coat of waterbased acrylic paint. 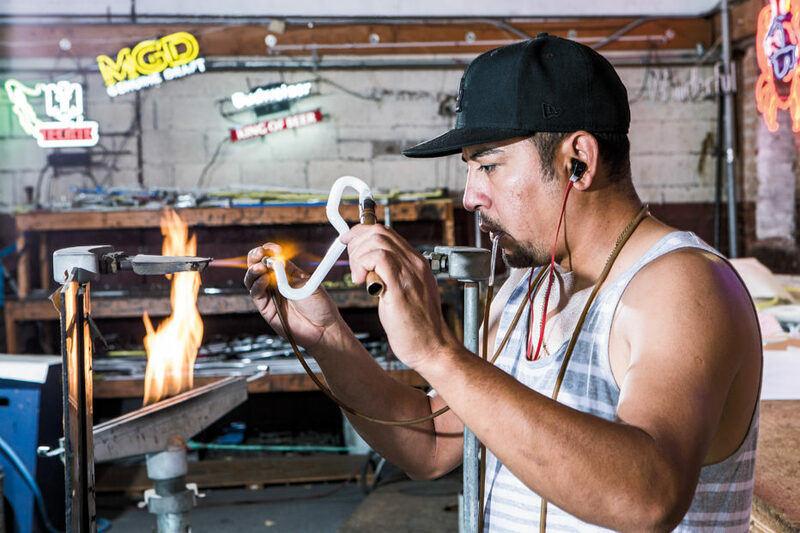 Using acrylic welding glue, Duarte anchors the neon sculpture to a sturdy piece of glossy plastic back- ing, along with a transformer for powering the electrodes. (When Martinez wants part of the sign to blink, he inserts a second transformer with a component called a flasher.) As with every stage, precision is key. Martinez makes sure it's centered just so. Eight days of bending and assembling later, the piece is fin- ished. All that's left to do is plug it in--and cross your fingers. "There's a nervous feeling when you turn it on for the first time," Martinez says. "The outcome can be a little different from what you imagined." Isn't it always?